Rediff.com » Movies » When Munni met Dhak Dhak girl! When Munni met Dhak Dhak girl! Madhuri Dixit and Malaika Arora Khan pose for shutterbugs at the Jhalak Dikhhla Jaa press meet, in Mumbai on Tuesday. The actresses will judge the fourth season of the dancing reality show which kicks off on December 14. Besides the judges, some of the contestants like Czech beauty Yana Gupta who is teamed up with Dance India Dance winner and choreographer Salman Khan, also showed up for the press meet. Anushka Manchanda, who is know for belting out songs, is also among the contestants wishing to show of their dancing skills. Also game to show off his dancing skills is former Indian Idol finalist and actor Meiyang Chang, who did a pretty good job with his dancing partner. 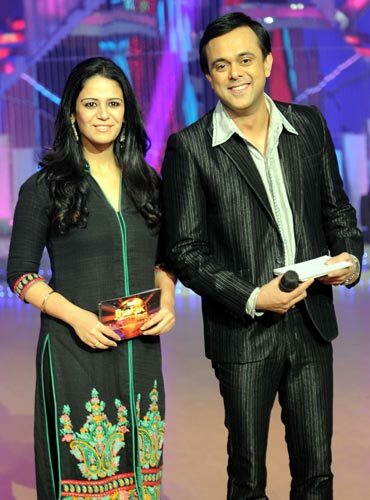 The hosts of the show, Mona Singh and Sumeet Raghavan, also put in an appearance.